Method PUSH is the technology that allows changes made in Method to sync in real-time back to QuickBooks. In order for this to occur, the Method Integration Engine initiates a TCP/IP connection to the server. If your IT manager has blocked outgoing TCP/IP connections or has blocked ports on your network, Method PUSH may not work. With QuickBooks open, open the Method Integration Engine. 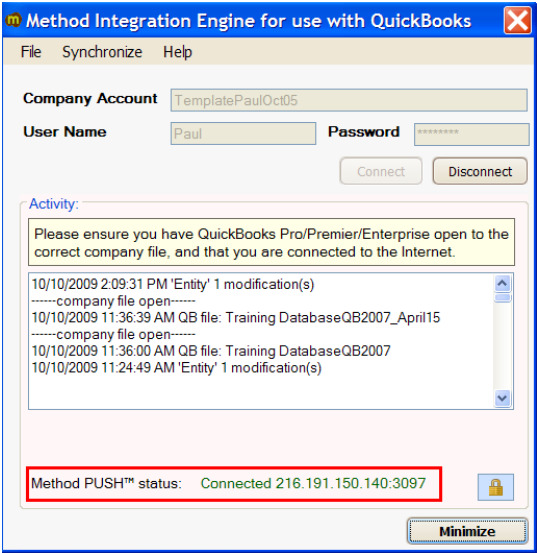 If the Method Integration Engine is not open, click Start > Programs > Method > Method Integration Engine for Use with QuickBooks. If the Method Integration Engine is not visible, right-click on the Method icon in your taskbar next to the clock in the lower right-hand corner of your screen, and click Display. Enter your Method Account, User Name and Password. Wait until the synchronization is complete. Check the Method PUSH status. If the status shows “Connection Failure” instead of “Connected” or “Not Connected”, an issue with establishing an outgoing TCP/IP connection has occurred. Hover your mouse over the “Connection Failure” label to see if additional information about the message shows. Check with your IT manager to ensure that you have a high-speed internet connection. Check with your IT manager to ensure that your anti-virus and firewall settings permit an outgoing TCP/IP connection. Navigate to the Engine Log folder. If you are using Windows XP, the Engine Log folder is typically “C:\Documents and Settings\All Users\Application Data\MethodIntegration”. If you are using Vista or later, the Engine Log folder is typically “C:\ProgramData\MethodIntegration”. If you are using Vista or later and do not see this folder, you must edit your computer settings to show hidden folders. Create an empty text file called “MethodPush.config”. Put the following into the contents of the file, where 3000 is an example for the lowest port number in your IT manager's desired range, and 3100 is an example of the highest port number in your IT manager?s acceptable range. In the Method Integration Engine click Disconnect, and then Connect.